Is my baby growing as it should? The growth scan, which is sometimes called the wellbeing scan or positioning scan, takes place when you are between 23 and 40 weeks pregnant. It checks how well your baby is growing and their position in the uterus (womb). record the position of the placenta. 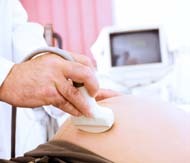 The measurements of the head, tummy and leg allow us to estimate fetal weight. We plot all the measurements on a chart against the normal range and this enables us to assess the fetal growth. Your baby is likely to be an average size if the measurements are all within normal limits. If concerns arise from the results of this scan, you will have the opportunity to discuss their implications with our consultant obstetrician. Because babies grow at different rates from week to week, a series of scans can be more helpful than just one. You may want, or need, a series of extra scans to track and monitor the growth and wellbeing of your baby. This may be because you had complications in a previous pregnancy, or have a medical condition such as diabetes or high blood pressure. We also offer extra scans if you are expecting twins. The baby's position usually becomes stable from 37 weeks onwards. Hence we can perform a scan to determine the position at this stage. If the scan reveals a breech position we can then discuss options open to you such as external cephalic version (ECV) or caesarean section. ECV is the act of turning the baby by hand. Your baby is breech when their bottom, foot or feet, instead of their head, leads the way out of the uterus. if you have concerns of your baby's well-being at any stage of your pregnancy.